Written in 1947, just after the end of World War 2, this play brought Miller his first major success. The setting is the unremarkable backyard in a comfortable ordinary American suburb. Joe Keller, now retired from running his factory, which had been given over to the production of airplane parts during the war, is an especially popular figure and the Keller’s home is a drop-in for all the neighbours. But Joe harbours a half-forgotten secret and his son Chris cannot forgive but must expose the wartime profiteering. A searing drama of conflict between father and son. THIS is a fabulous play, a work of genius. Indeed, if I was ever banished to a desert island and I could take three great works of literature to read and re-read under my favourite palm tree,?All My Sons?would be one of them. So why then, were there empty seats at Altrincham Garrick on Tuesday night? A modern day classic, Arthur Miller's play is a compelling family drama full of white-hot emotion and gentle humour. Some of the lines are so evocative, so inspired, so jaw droppingly perfect, you'll want to bottle them on the spot. Director Celia Bonner has created a production that moves and amuses, and Miller, without standing on his soapbox, makes you question your own morality. Just how far would you go to make a fast buck? Businessman Joe Keller, brilliantly played by Martin Oldfield, isn't a totally unsympathetic character, reminding those who sit in judgement that HIS money has paid for their comfortable lifestyle. The heated exchanges between Martin and his stage son Joe - I can't recall a better performance by John Keen - simply stunned us into silence. It was the emotional equivalent of being hit by a ten-ton truck. It was one of those occasions when you forget you're watching actors. There isn't a weak performance from anybody, with Carole Carr breaking a few hearts as the lovely Kate Keller, the all American housewife who simply won't give up her fighter pilot son for dead. The whole of Trafford should see this - if only that were possible. Not a word is wasted. In?All My Sons, the great American playwright Arthur Miller returns to his familiar theme of fathers having their worlds torn apart. And believe me, these are spectacular, emotional events that leave crater like holes in the lives of those left behind, those left to pick up the pieces. Celia Bonner is directing this powerful family drama for Altrincham Garrick and talking to her about the play you get the impression that you're preaching to the converted - to put it mildly. 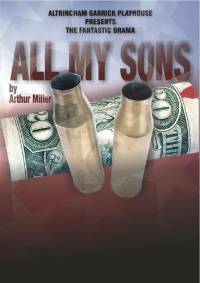 ?All My Sons?is the story of Joe Keller, a small town businessman who is suspected of selling faulty aircraft parts to the US Air Force during World War Two. His business partner has been sent to jail for doing just that while Keller continues to protest his innocence. Celia is thrilled to be working with such a strong cast, a company that includes Martin Oldfield as Keller. She says that simply rehearsing the play is a deeply emotional experience. Celia also believes Miller influenced numerous other playwrights, including Alan Ayckbourn. "The way Ayckbourn reveals deep under currents that are going on in families I'm sure must owe something to Miller," she says. She hopes people won't be put off, believing?All My Sons?to be a heavy going piece of theatre. "As well as all the personal agonies in it there are resonances for today as well. There was an article in one of the national newspapers just before we started rehearsing it about a company supplying contaminated water to the troops in Iraq," she says. Theatregoers who are regular viewers of the TV soaps will also feel at home, insists Celia. "It's a really powerful drama about a family, so if people like soaps, which are often about arguments and really powerful conflicts within families, they'll love this. Sometimes people think Miller is difficult and he isn't. He is such a brilliant writer and not a word is wasted," she says.